I’m intrigued by the debate that’s raging among winemakers, critics, and wine consumers about alcohol content in wines. I wrote a post a few months ago, “How High Is Too High,” where I laid out the basic arguments on both sides. OK, I admit that I didn’t present a totally unbiased opinion — I think my verbal “body language” showed that I sided with the go-for-it, balls-to-the-wall kind of wines. So in his column, “A Gadfly in the Pinot Noir,” Asimov recounts the tale of a panel he moderated at a recent Pinot Noir symposium. Now, that’s not a situation that would seem to invite verbal fireworks, but there was a dramatic twist near the end of the proceedings that has created a mini-uproar in the wine community. Check this out, and let me know what you think. IT’S been called the Ol’ Switcheroo, and the Great Pinot Noir Kerfuffle. Depending on your point of view, it was either a surprise changeup that proved a point, or a dirty trick that proved nothing at all. Either way, the stunt that the winemaker Adam Lee pulled at a pinot noir seminar earlier this month has evoked both claims of vindication and cries of outrage throughout the wine-drinking world. I had a ringside seat. In fact, I led the seminar, held at the World of Pinot Noir, an annual gathering of producers, people in the trade, enthusiasts and writers in Pismo Beach, Calif. The topic was alcohol and balance in pinot noir. I was joined by five pinot noir producers from California and Rajat Parr, the wine director for the 18 restaurants in the Michael Mina Group. 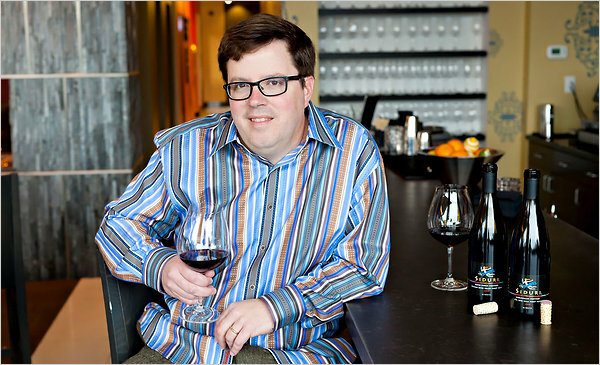 At one of those restaurants, RN74 in San Francisco, Mr. Parr has a policy of not serving pinot noirs or chardonnays that are above 14 percent alcohol. Before I get to the celebrated moment, allow me to set the scene. Each producer brought two of their wines, which were poured for the audience of about 100 and, of course, for the seven of us onstage. The producers included Mr. Lee of Siduri along with Jim Clendenen of Au Bon Climat, Adam Tolmach of Ojai Vineyard, Josh Jensen of the Calera Wine Company and Michael Browne of Kosta Browne. The issue of alcohol and balance has been one of the most polarizing in wine over the last decade, especially in California, where some pinot noirs offer alcohol levels little seen outside of zinfandel and amarone, rising past 15 and even 16 percent. Some praise these wines, arguing that alcohol levels do not matter as long as wines are balanced. Others condemn them, asserting that such size and power are a distortion. In my effort to frame the discussion, I suggested that this debate had special meaning for pinot noir, which in its Burgundian guise has historically been prized for its lightness and finesse. Were these bigger wines simply a stylistic evolution? Or were they an aberration? Who decides? The discussion went fairly reasonably, or at least as reasonably as possible when seven passionate voices, on all sides of the debate, must be heard in 1 hour and 15 minutes. At one point, I had Mr. Parr elaborate on his policy at RN74, a restaurant that is an homage to Burgundy. He said the 14 percent limit, which he reiterated applied only to the Burgundian grapes pinot noir and chardonnay, was where he found the most balance and pleasure in those wines. Soon, everybody on the panel had spoken. I was wrapping things up when Mr. Lee grabbed the microphone. The two pinot noirs he had poured earlier were a 2008 Cargasacchi Vineyard from the Santa Rita Hills at 13.6 percent alcohol and a 2009 Keefer Ranch from the Green Valley at 15.2 percent. Now, he wanted to let everybody know that Mr. Parr had just offered to buy some of the Cargasacchi. Dramatic pause. Chaos ensued. As the story spread, often in forms that were exaggerated or simply wrong, many on the Internet crowed that Mr. Lee’s stunt exposed Mr. Parr as a hypocrite who got his comeuppance. Mr. Lee told me later that his intent was simply to demonstrate that a pinot noir could be balanced even if it was above 15 percent alcohol. That may well be true. Balance is important, but it is just one of many factors in evaluating a wine, and it’s a quality that extends beyond alcohol. Too much acidity, or too little, for example, can throw a wine out of balance. Alcohol, moreover, is not simply about heat. Higher alcohol tends to add weight and richness to a wine, qualities that when excessive are antithetical to good pinot noir. What is excessive, of course, is a subjective question. Ultimately, Mr. Lee’s switch-up proved very little. Nobody was asked to guess the alcohol content of the wines. In fact, we paid very little attention to the wines at all in our discussion, especially those of us sitting onstage. Mr. Parr, one of the most skilled blind tasters I know, can be excused I think for not questioning an assumption in that context. What’s more, his offer to buy the wine, he told me, was not for RN74, but perhaps for one of the Mina steakhouses. In the end, the stunt was counterproductive. Up to that point, the panelists had surprised me by their live-and-let-live attitude. Each had insisted that they would never presume to dictate to others what sorts of wines to make. Yet, strikingly, each seemed to feel threatened by any criticism of the style of wines they preferred. This was an understandable, very human feeling, I thought. Much of the contentiousness surrounding California wine can be better fathomed if we can grasp how vulnerable people feel. Yet, as we ended the seminar and seemed to be coming together in at least a common understanding, Mr. Lee lobbed his Molotov cocktail, sending everybody back to the trenches. From The World Atlas of Wine – Fifth Edition, by Hugh Johnson and Jancis Robinson. A south african came to the conference in Bolzano with two wines: a pinotage fermented out to 15.2% alcohol (Control). Then de-alcoholised to 13.2%. I found that an impromptu blend (50-50, producing approximately 14% alc) was best. The low alcohol was weak in the mouth (it became obvious that alcohol is essential for a rich, full mouthfeel, but 15% was too hot in that particular wine). I concluded that 13.8%-14.3% in the final wine is optimum for both immediate drinking and aging. I have tasted alcoholic Australian Shiraz that has been aged. When the youthful fruit drops out, you have a wall of alcohol that is not pleasant. However, in their youth, I’m sure they were stunners. The best balance seems to be a compromise at 14%. Thanks for your comment and your interesting research. I agree that often, “high alcohol = unpleasantly hot,” and that’s not fun to drink. But it does seem that some varieties, and some winemakers, can handle high alcohol levels better than others. I was interested to read the opinion of Adam Lee, winemaker at Siduri, who makes really great Pinot Noir that pushes the alcohol envelope. He says (like the Australian winemakers) that it’s all about balance. And I really love his wines!